Making meals in the Instant Pot is fun and easy. 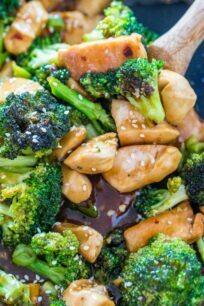 We like a good and easy meal like our popular Orange Chicken, Pressure Cooker Mongolian Beef and Instant Pot Mongolian Chicken. 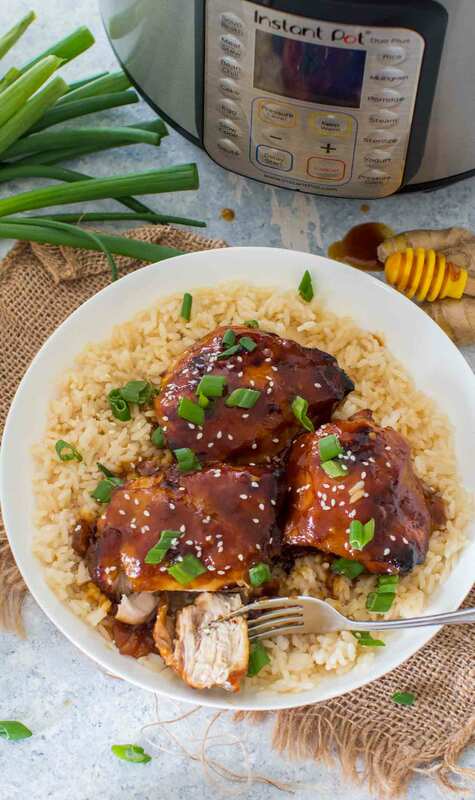 The Instant Pot Honey Garlic Chicken thighs are the perfect quick and easy meal that is also budget-friendly and so tasty that everyone will lick their fingers clean. 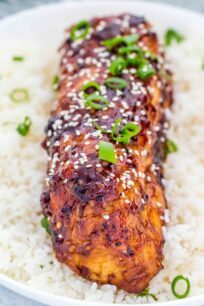 The thighs are marinated in the most amazing honey garlic sauce, that is a great combination of sweet and savory. What I love most about this recipe is that you can marinate the chicken in advance and cook it when you are ready. You can also add all the ingredients to a freezer friendly ziplock bag and freeze it. Just thaw the day you want to cook this for dinner, the flavors will be amazing. Once cooked, the chicken thighs are broiled for a few minutes to crispy perfection. Served with the delicious, sticky honey garlic sauce. Watch the video steps below on how to make this perfect recipe! How to make chicken thighs in an electric pressure cooker or Instant Pot? You always have to use at least the minimum liquid requirement for your pressure cooker. For this recipe, I used a 6 quart Instant Pot and I used about 1.5 lbs of chicken thighs. There are different methods to cook the chicken thighs: on the rack that usually comes with your pressure cooker or to directly add the chicken in the liquid on the bottom of the pot. The cooking methods depend on the recipe and the result you want. It is best to cook the meat in the liquid. Because, it contains all the flavors and its intended to flavor the chicken. If the recipe is heavier on seasonings and the intention is to have the rub on the chicken. It’s best to cook the chicken on the rack. In that case, for the liquid part, only water or broth is usually used as it’s not used to add extra flavor to the meat itself. I find 15 minutes to be enough cooking on High Pressure for 1.5 lbs of chicken thighs. That comes down to about 4 chicken thighs. If you want the meat to be so tender that it falls off the bone, you can increase the cooking time to 20 minutes. I like 15 minutes, as the chicken is tender and it also gets cooked under the broiler for extra crispiness. Always do a 10-15 minute Natural Release when cooking meat. If you do a quick release, the meat will toughen from the quick change in pressure. Place thighs on a lined cookie sheet and brush them with the sauce. Then broil for 2-5 minutes, watching carefully not to burn them. 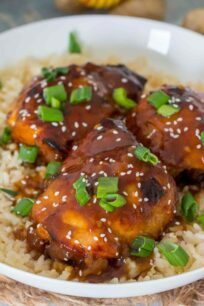 Can I make these Instant Pot Honey Garlic Chicken Thighs ahead of time? Add all the sauce ingredients to a medium bowl and mix until the sugar is completely dissolved. Add the chicken thighs to a large freezer zip lock bag. Close the bag, shake to coat all the pieces and freeze flattened so all the chicken thighs are covered in sauce. When ready to make, remove the bag from the freezer in the morning and move it to the refrigerator to thaw. Once thawed, shake well, and add all the ingredients to the pressure cooker. 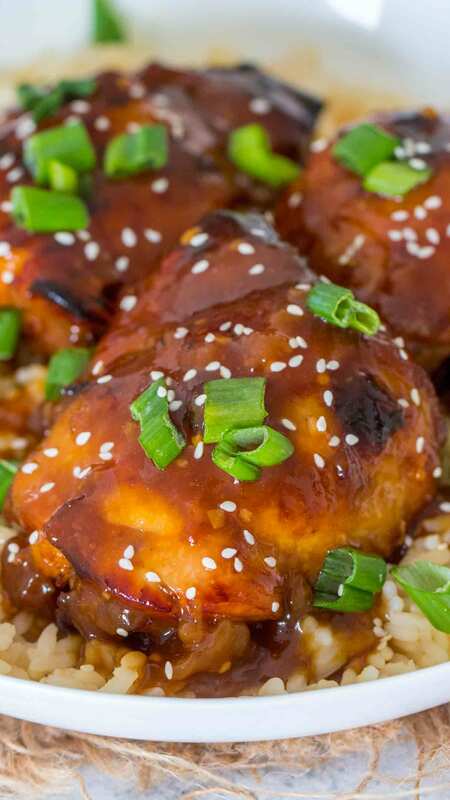 What is best to serve with Honey Garlic Chicken Thighs? A Natural Pressure Release means that the pressure is released gradually. For a Natural Pressure Release, you click on Keep Warm and wait 10 minutes. After which, you open the valve and let any leftover pressure to release. Another option is to Turn Off/Unplug the pressure cooker, wait 10 minutes and after that open the valve. Instant Pot – I use it all the time, I have the 6 quarts one. It makes weeknight meals so much easier. Add all the sauce ingredients to a medium bowl and whisk until all well combined. To add the sauce and the chicken thighs to the Instant Pot and cook. To add the chicken to the sauce and marinate for a few hours. To add the chicken and the sauce mixture to a freezer friendly ziplock bag and freeze. When you are ready to cook the meal, add the sauce mixture to the instant pot. Add the chicken thighs in one layer on the bottom of the pot. Close the lid, make sure you Seal the valve and cook on High Pressure for 15 minutes. Once the Instant Pot beeps, let the pressure naturally release for 10-15 minutes. In the meantime, turn on the oven broiler and line a baking sheet with parchment paper. Gently remove the chicken thighs from the Instant Pot and place them on the prepared baking sheet. Brush them with some of the sauce and place them under the broiler for 2-5 minutes on each side. Watch them closely not to burn. In a small bowl combine cornstarch and water until fully combined. In the meantime, turn the Sauté button on, and add the cornstarch slurry to the Instant Pot. Stir to combine and simmer for 2-3 minutes. Let stand, the sauce will thicken. Serve the chicken over rice, and pour the sauce on top of the chicken. Garnish with sesame seeds and chopped green onions. Enjoy! You can also make this recipe with chicken drumsticks, the cooking time stays the same. The directions say, “Add all the sauce ingredients to a medium bowl and mix until the sugar is completely dissolved.” There is no sugar in the list of ingredients. Or am I just missing it? sorry, my bad, I updated it. There is no sugar, you are right. This chicken looks so juicy! 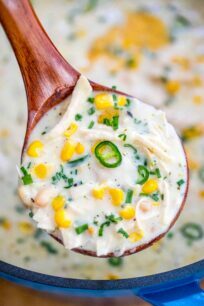 This looks SO delicious!! YUM! I love how you break the whole process down! I feel more comfortable trying this now! Looks so juicy and delicious! Love how easily this comes together in the Instant Pot. Instant Pots make busy nights so much easier! Gonna try this soon! I’m an Instant Pot Rookie! Yes, marinate frist, sauce the chicken breast on each side for 2-3 minutes, add the sauce and cook for 5 minutes of high pressure. Remove the chicken breasts, add the cornstarch to thicken the sauce, serve over chicken. I made this tonight and it was a hit!! My VERY picky 5 year old exclaimed that the chicken was delicious and she wanted to eat it every night! Needless to say, I was shocked. I made this with frozen bone-in chicken thighs and cooked for 22 minutes. Thanks for the easy, tasty recipe! Glad that you liked it!!! The recipe says to “Add all the sauce ingredients to a medium bowl and whisk until all well combined”. According to the recipe list, this would include the cornstarch slurry, but then the slurry comes back into play in step 7. I might be missing something, and if I am, then sorry. Hi Theo, sorry fo rah confusion, the Cornstarch Slurry is a separate category, I have updated for it to be displayed properly. I will try the recipe tonight but won’t put the chicken on parchment paper. Parchment paper catches on fire under a broiler. Aluminum foil is now considered dangerous when heated so maybe just clean the baking dish after use. Looks delicious. 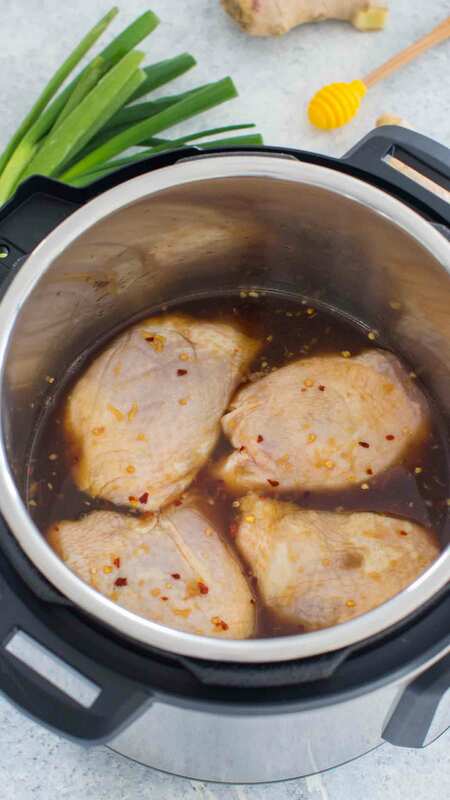 How would the cooking time vary for the Instant Pot if I were to use boneless and skinless chicken thighs? For whole boneless/skinless thighs I would do 6-8 minutes with 10min NPR. Just double the ingredients, cooking time stays the same. no, same cooking time, it should turn out the same. This was delicious. I made extra sauce when I made it the first time last week and wondered how I could use the leftover sauce (I have lots) in a new batch. Since it’s already thickened, can I still use it to make more? Thanks for any guidance and for the great recipe. I made this tonight, followed directions to a tee except not marinade meat. This turned out yummy!